Amber Heart, or Kent Bigarreau as it is also widely known, is probably the most commercially important English "white" cherry. 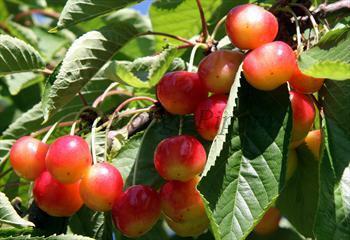 It has a pleasant and traditional flavour, noticeably different to modern cherries. As its alternative name suggests, this variety was the mainstay of Kent cherry orchards during the first half of the 20th century. "White" cherries are so-named because of their pale white-yellow flesh. The skin colour is usually golden yellow overlaid with orange and red. Please fill in the details below and we will let you know when Amber Heart cherry trees are back in stock. A white-fleshed cherry with an excellent flavour - a good alternative to Amber Heart if you only have space for 1 tree because it is self-fertile. Amber Heart is in flowering group 4. Amber Heart is self-sterile and needs to be pollinated by another tree of a different variety nearby. Amber Heart is not self-fertile, but can be pollinated by any of the modern self-fertile varieties - Stella or Sunburst for example. Although commercially successful in its time, it has been replaced by newer varieties which are less prone to the fruit-cracking and canker problems.